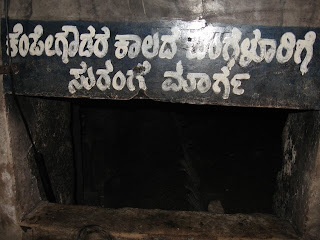 In the last post, I mentioned about Goravanahalli temple visit. 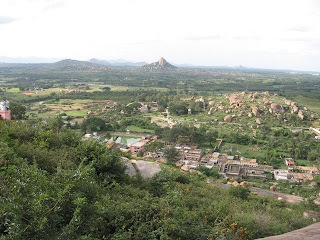 On our way back to Bangalore we went to Shivagange – a place for the pious and adventure enthusiasts. 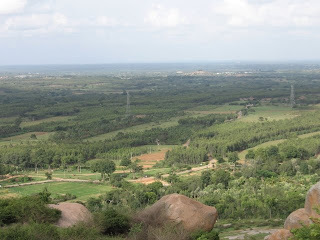 Shivagange is about 50 kms from Bangalore and 8 kms from Dabas Pete on way to Tumkur on NH4. 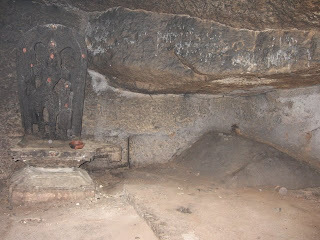 Shivagange,a rocky hill appears in 4 different shapes in 4 directions in the form of Nandi , Lord Ganesha, Shiva Linga and Cobra. 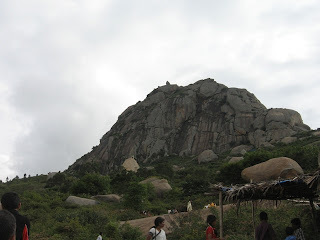 As you climb the rocky hill, you will find shrines at almost each halting point. 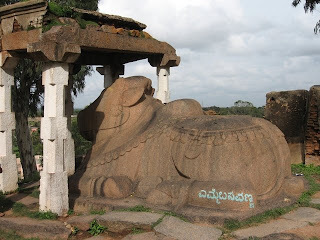 Statues of Nandi or Basava carved from rocks are also seen, though called by different names – Emme Basavanna, Harake Basvanna. We were told about the monkey menace on offer in the place and were told to be on alert about our belongings! But to our surprise no monkey dared to try its tricks on that day! 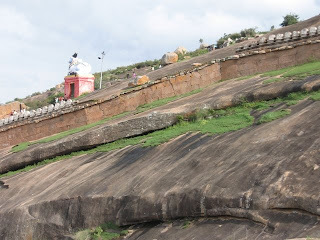 Steps to climb the hill are carved out of the rocks as it is done to help the devotees. Gopuras, old monuments, also a fort wall fill the canvas of the Shivagange pictures. Main entrance for the Shivagange temple is being constructed. As you reach near the peak of the hill, you will find your batteries need to be recharged as you would have exhausted by then. Eatables, soft drinks are available at several halting points in the rocky hill. 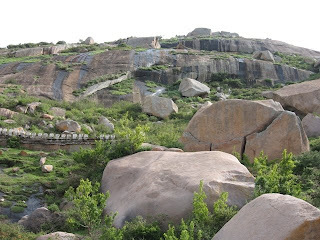 When we were exploring the place, we used to stop at various heights to see a glimpse of the land below and how they were shrinking in size when we climbed newer heights. Needless to say that breath taking photographs were taken after that! Our aim was to reach the top as early as possible. 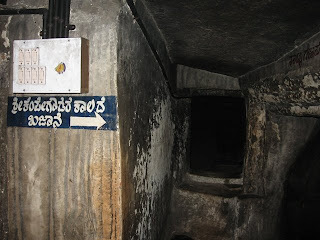 On the way, we went to Olakall theertha. 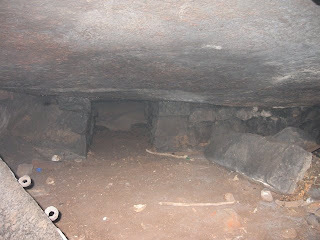 Olakall theertha is a cave like structure. Place is dark with no electric lamps. After initial hesitation we were on our way inside. 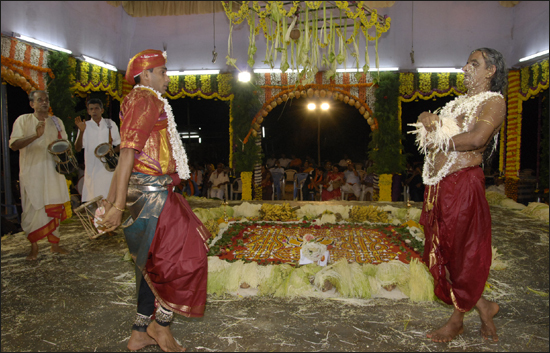 After getting the Theertha or the holy water for the first time, we were thrilled and went there again now without fears! When we looked at our watches by this time, it was already 5 30 pm and it was time to return back to Bangalore, leaving aside the hope of reaching the top of the hill. 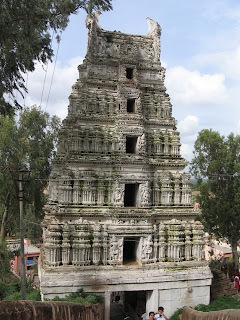 On climbing down the hill, we went to this temple, dedicated to Lord Shiva which also houses treasure room of the times of Kempegowda, king of Bangalore and tunnel route to reach Bangalore in those times. Time was not permitting us to explore the place further. We also missed visiting Pathala Ganga temple. On our back home, plans were already in place to visit the place for the second time.